The failure by many churches in southern Africa to embrace social issues such as women’s empowerment and gender diversity is increasing homophobia, a report has revealed. The report titled No Longer Silent has been published by South Africa-based The Other Foundation at the time the region is grappling with the increasingly visible reality of homosexual and bisexual women and men, as well as transgender and intersex people. The report singles out Christianity as one religious group which is struggling to embrace gender diversity and understand human sexuality issues. “Although there are multiple manifestations of the faith, Christianity in the region is largely unreceptive to progress on social issues such as women’s empowerment, gender diversity and advances in the understanding of human sexuality. “While some southern African Christians have opened their hearts to their LGBTI sisters and brothers in the spirit of an inclusive Gospel, most continue to act in an exclusionary way,” reads the report in part. Branding many churches as hotbeds of homophobia, the report observes that their hostility towards LGBTI people does not only hold back legal and policy reforms but also drives stigma, bullying and violence in the larger society. Homophobic church leaders, notes the report, preach that God commands Christians to rebuke and exclude sexual minorities thereby contributing strongly to the discrimination, hatred and violence faced by LGBTI people in the region. “The greatest obstacle to the full acceptance of LGBTI people in southern Africa is religiously sanctioned homophobia,” says the report. The situation is complicated by the fact that homosexual relations are still criminalized in most of southern Africa with the exception of Mozambique, Lesotho, and South Africa. The report also reveals that some fiery African clerics who are against LGBTI rights completely forget that all their arguments are based on Western mediated Christianity which has for years been fighting hard to root out pre-colonial practices. Western-mediated Christianity in southern Africa entrenched a sexual discourse that anathematized open discussion of sexuality in families and communities. “This was a Christianity that even went as far as deciding which sexual positions were godly or ungodly,” notes the report. Up to this day, the church-sponsored homophobia justifies itself through a narrow reading of cherry-picked Biblical passages dealing with human sexuality and gender relations, ignoring the fact that the Bible, like any complex text, needs to be read and understood as a whole. While some conservative clerics strongly oppose LGBTI rights, some modern religious leaders who read the Bible holistically accept LGBTI people to be their members of their churches based on principles of love, compassion, tolerance and selflessness. “These Christian allies see the outstretched arms of Christ on the cross as a symbol of God welcoming all into His kingdom. They oppose narrow, homophobic interpretations of scripture and point out that the key message of the Bible is God’s love for all human beings,” observes the report. Such religious leaders promote freedom, respect for the equal dignity of all people and the rule of law and have consistently spoken out against poverty, injustice and violence. Commenting on the study findings, Centre for Solutions Journalism-Malawi executive director Brian Ligomeka observed that the report mirrors the homophobic reality in southern Africa. “A lot of work and advocacy need to be done to teach the masses to appreciate concepts of gender equality, diversity, tolerance and peaceful co-existence,” he said. Some arguments used to fuel homophobia do not hold water. For example, the argument that homosexuality and gender diversity are a neocolonial and foreign conspiracy tend to ignore the fact that Christianity too is not originally from Africa as it is also a western import, brought by western missionaries. In pre-colonial Africa, people belonged to different traditional religions which had their own ways of embracing diversities but that change following the introduction of Christianity by missionaries from the West. 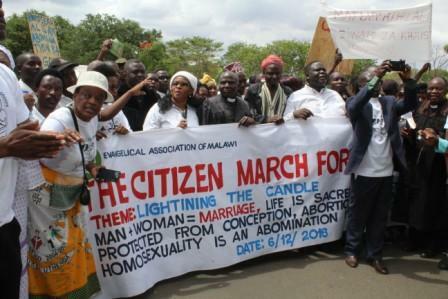 In Malawi religious leaders last year led street protests marching against review of reproductive health and LGBTI laws.